Ping Pong Planets “The hilarious drop-in/drop-out LAN game where you bounce rocks into your friends”. Based on our gamejam-winning game Hittin Worlds, Ping Pong planets is a local multiplayer game which runs on a Windows or Mac computer, with players controlling their actions from their phones or tablets. 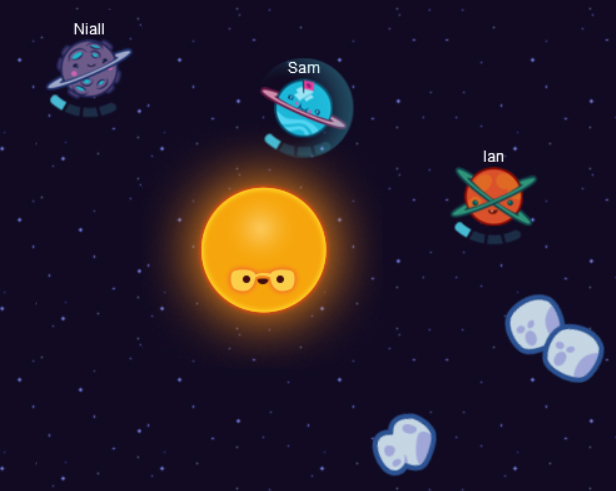 Each player plays as a planet, in orbit around a sun. Asteroids are flying about, and players have to use their forcefield to deflect them. By using a virtual joystick-style controller on their phone, they orient the forcefield in specific directions.. incoming asteroids get deflected in that direction. The idea is that players fling the rocks at each other while defending themselves.